Authored by DPSI Professional Services Consultant Robert Brieck, this post originally appeared on Manufacturing.net. Many companies, large and small, have storerooms or warehouses containing inventory ready to ship directly to customers. In other cases this inventory is, hopefully, dedicated to support companies’ maintenance, repair and operations (MRO) programs. Key Performance Indicators (KPIs) can play a significant role in managing production departments. Production departments typically report the number of units produced per man-hour worked, or the number of units produced per kilowatt hour. Measuring KPIs such as these allows companies to manage production of those units, thereby controlling cost. Maintenance departments, however, measure different parameters such as the number of Work Orders in backlog. They may also compare the amount of Preventive Maintenance Work Orders performed versus the number of Emergency Work Orders generated and completed over a given period of time. Maintenance uses these efforts to control their cost and support production departments by keeping assets/equipment in peak operating conditions. Now, let’s turn to inventory. Inventory used to support MRO programs is managed by maintenance departments. Maintenance should be able to identify and determine necessary items to stock, the quantity of those items and which assets/equipment those items support. This in most cases is not the responsibility of inventory departments. Failure to properly manage inventory can lead to a significant waste of company dollars. Funds otherwise allocated to important business endeavors may end up being spent on unnecessary spare parts. Overstocking leads to parts simply sitting on shelves for extended periods of time. Ordering the wrong or insufficient parts can result in excessive equipment downtime and a lag in production. Many inventory departments aim to keep just enough MRO items to support maintenance without overstocking parts. It’s a delicate balancing act in which companies struggle to keep up. Departments may attempt Just in Time (JIT) ordering, a strategy used to decrease waste by receiving items only as they are needed. This method can lead to drastic effects on maintenance and overall production since departments rely on identifying the correct Reorder Point to sustain production lines. Finding the magical point to reorder the correct quantity of low stock items at the correct time so as not to be STOCK OUT during a critical moment is possible, however it can be challenging. Inventory accuracy: Actual count/Computer reported on-hand balance. Acceptable range is greater than 95 percent. Calculate weekly. Dollars spent on emergency purchases compared to overall purchases: Emergency dollars spent on purchases/Total dollars spent on all purchases. Acceptable range is less than 2 percent. Calculate monthly. Stock outs: Number of occurrences/Total pieces issued. Acceptable range is less than 1 percent. Calculate weekly. Days of inventory on hand: Total inventory valuation/Average daily dollars used. Acceptable range is less than 30 days on hand. Calculate monthly. Slow-moving parts: Number of parts identified as slow or no movement/ Total parts in inventory. Acceptable range is less than 5 percent of total stock units. Calculate monthly. Back orders and vendor performance: Items delivered/Items ordered. Acceptable range is 98 percent. Calculate monthly. Selecting five meaningful KPIs for your organization is an ideal starting point. It’s best to revisit your company’s mission statement and strategic goals when deciding which KPIs would be most beneficial for your organization. The process of establishing KPIs should be done collectively, with support from all departments before instituting. Most importantly, KPIs should be relevant, measurable and reportable. Most computerized maintenance management software (CMMS) programs on the market today allow users to interface with Work Orders and Purchasing. 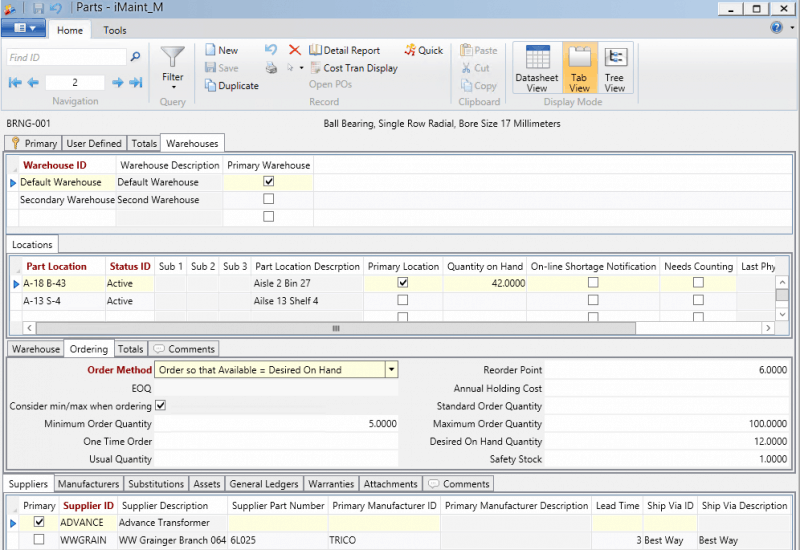 Warehouse form within iMaint EAM gives an overview of stocked items in real-time, what’s on order and what’s committed to be used on a work order along with cost. This simplifies the process by performing calculations for Economic Order Quantity (EOQ), or offering a realistic reorder point level based on various factors such as lead time and turnover quantities of an individual part. Part form within iMaint EAM displaying example reordering options. A successful CMMS program can provide much, if not all, of the data required to calculate meaningful KPIs and subsequent graphing of those performance indicators over a period of time. Employing a CMMS program for inventory and maintenance MRO can also provide a 19.4 percent savings in lower material costs. I cannot stress strongly enough that if you’re not measuring, you’re not managing. You wouldn’t continue writing checks if you are unsure of whether or not your checking account has sufficient funds to support them. (At least you shouldn’t!) Similarly, you’d be remiss by neglecting to incorporate key performance indicators into your spare parts inventory strategy. Utilize KPIs to manage your spare parts inventory and continually improve your production line—and consider a CMMS program to aid in your overall operations.